The house was completely renovated inside and out the end of 2014, a new bathroom and kitchen were installed. 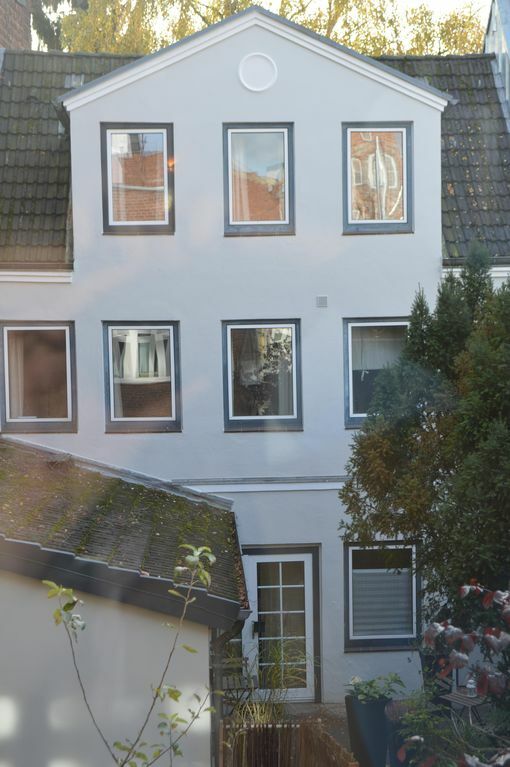 It is located in the courtyard of a typical Luebeck town house with terrace and right in the center of the old town. The apartment is on two floors, has a living room, kitchen, bathroom and two bedrooms. All is well equipped, carefully decorated and just waiting for our guests. Vollgefliestes shower room with heated towel rails and bathroom cabinet with large mirror. Lovely, bright, and a beautiful garden! We had the most wonderful time here. It is an amazing location and beautiful apartment. The garden was absolutely lovely too. Near grocery stores, marzipan, and bakeries. Just the best! Very tranquil, delightfully decorated appartment with modern amenities, all of which worked as they should. If you are infirm in any way though you need to be aware of two steep staircases. Very comfortable beds and bedding. Location perfect for visiting all museums and attractions of Lubeck which is a glorious town. There was plenty to occupy us over 6 days. Die Wohnung liegt sehr ruhig gelegen in einem Hinterhof direkt in der Stadt. Schlüsselübergabe und Abreise lief ohne Probleme ab. Wie haben den Aufenthalt sehr genossen. vi møder en pæn og ren lejlighed. Trappen op til lejligheden er lidt stejl, og knap så sjov at bærer baggage op af. Men selv lejligheden er hyggelig og fungere. Den er tæt på bager og gå gaden. Da vi ankom havde vi lidt problemer med at finde en ledig p plads, men det lykkes efter at have kørt rundt, i et p huset tæt på. vil gerne komme igen. Very nice apartment in the middle of everything. Second time we rented this apartment and we would like to again. Very nice and cozy. Walking distance to christmasmarket and all shopping. Die FeWo liegt zentral in einem sehr schön gestalteten Hinterhof und ist sehr geschmackvoll und nett eingerichtet - eine kleine Wohlfühloase, von der aus man Lübeck erkunden kann. Ärgerlich war, dass der Vermieter zwar angekündigt hatte, dass er sich mit mehr Informationen melden wird, dies aber nicht tat und auch auf mehrere SMS und Anrufversuche erst gegen 17:30 h des Anreisetages reagierte. Bis dahin standen wir vor verschlossenen Türen ohne zu wissen, ob wir uns für die Nacht nicht eine andere Unterkunft suchen müssten. Davon abgesehen ist die Ferienwohnung sehr empfehlenswert. Anreise ist üblicherweise um 16Uhr, wird eine andere Zeit gewünscht, sollte dies rechtzeitig vorab besprochen werden und lässt sich dann meistens einrichten. Leider können wir bei sehr kurzfristigen Wünschen nicht immer garantieren, unmittelbar reagieren zu können und ununterbrochen erreichbar zu sein, entspannter für alle Seiten wird es, wenn alle Fragen zeitnah besprochen werden. The apartment is located in the center of the UNESCO World Heritage old town of Lübeck in a house that has its roots in the 16th Century rich. St. Mary's Church and all other medieval town churches, the Holy Spirit Hospital, St.-Annen Museum, City Hall and Castle Monastery are within walking distance. The apartment is in a quiet area, a few steps from the door but are a variety of restaurants, pubs and clubs, theaters and cinemas and shops for all daily needs reachable. The old town is surrounded by water in the channel Travelodge can be excellent jogging, walking cycling and walking. There are boat trips possible, a swimming pool and a canoe rentals are nearby, as well as other tourist attractions such as the Günther Grass House, Buddenbrookhaus (Thomas Mann Museum), Willy Brandt Museum and the Behnhaus. A bus stop is 100 meters, parking garages and parking 300m.